4. In this case, Observe that the Firefox Browser has launched and closed for 3 times instead of once, for running the above three tests as shown in the below video. Why did the firefox launched and closed separately for each test method in the code ? 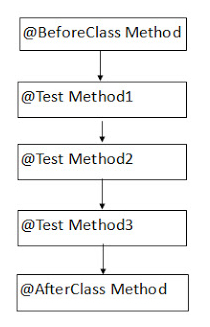 As we've three tests and we've written test method for each of our tests, hence we got 3 test methods in the Selenium Automation code. 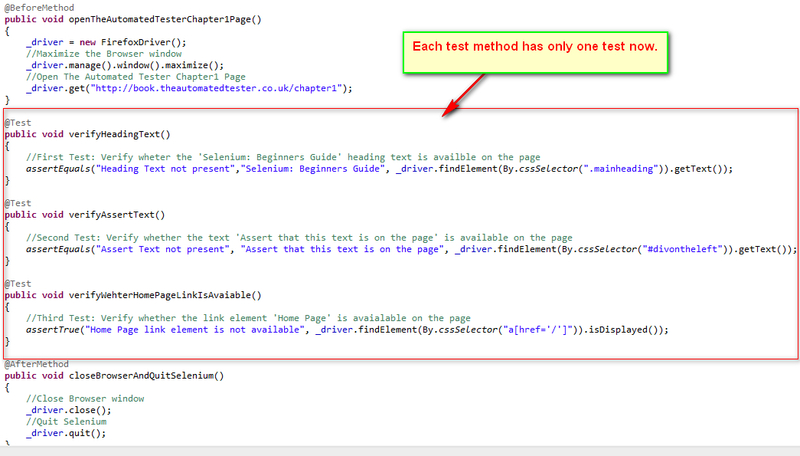 But in this case 'chapter1' page is common for 3 of the tests and hence its not required to close the application and launch it for performing the remaining tests. This has happened because of @BeforeMethod and @AfterMethod TestNG annotations. The code inside the @BeforeMethod and @AfterMethod annotations will be executed once for each test method in our Selenium Automation code. Since we've three test methods in our code, the methods under the @BeforeMethod and @AfterMethod annotations got executed thrice (i.e. once for each test method). Suppose if we want to run the methods under the @BeforeMethod and @AfterMethod annotations only once, we've to replace these annotations with @BeforeClass and @AfterClass. (i.e. 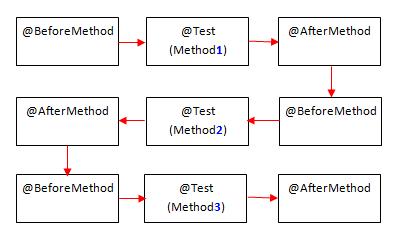 The method under @BeforeClass will be executed before executing all the test methods inside the class and The method under @AfterClass will be executed after executing all the test methods inside the class. So lets implement the @BeforeClass and @AfterClass TestNG Annotations in the next post. Using @BeforeClass and @AfterClass TestNG Annotations will be explained in the next post.